Frames, frames, and more frames! YEAH! My new batch of 19 frames came in this week so I've been busy applying polyurethane to seal and protect them from warping during use. This makes it a total of 32 frames that I have already. 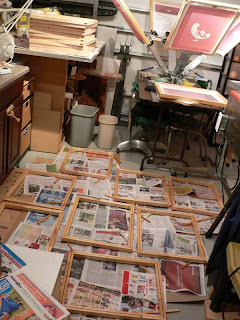 I use the stretch cord method to stretch the screens which makes it very easy to be a self sufficient silk screen studio. I'll be done tomorrow with sealing the second batch of frames so hopefully this weekend I will be able to test another one of my designs that I have ready on transparencies to burn onto screens. Next week I plan on stretching all of the frames with mesh and prep them for emulsion.